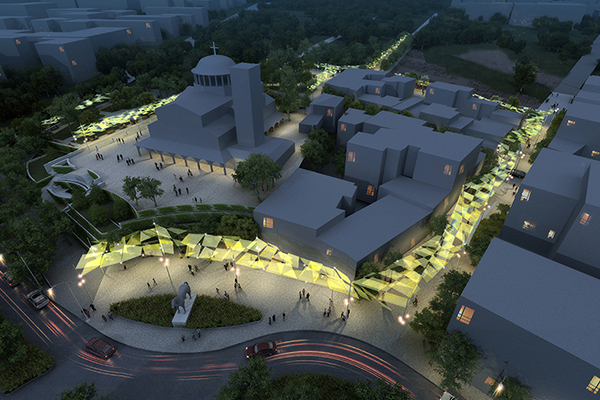 First Prize by the ECOPOLIS 2012 Awards for the Sustainable Urban Redesign (in Greece). First Prize by the ECOPOLIS 2017 Awards for Environmental Projects (in Greece). The aim of the design was the improvement of the microclimate in the area, namely reduction of surface temperature and air temperature during the summer season, improving the conditions of thermal and visual comfort and reduce pollutants. The total area of the reformation was ~16000 m² and the total budget of the project 5.000.000€. The project designed by SKROUBELOS ARCHITECTS (www.a-u-d-o.com) & City of Larisa Technical Department. Renewable | Kravvaritis & Partners | Consulting Engineers, were responsible for the Bioclimatic / Energy Simulation & verification of the project.